Handspring Visor users want it all. They want as many features as possible crammed into their Springboard modules. More and more, we're seeing Springboard modules that have more than one function. With the Handspring VisorPhone, one can 1) dial numbers directly from their address book, 2) use it as a GSM cellular phone, 3) send messages to others using SMS, and 4) dial into an ISP and browse the Internet. What more could you want? 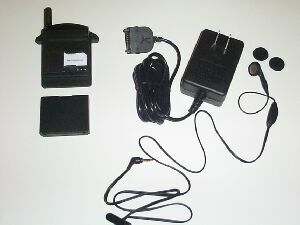 The VisorPhone uses the GSM Standard for the U.S. and operates at 1900 MHz. The back of the module detaches so you can insert your SIM card that your service carrier provides you with. One of the major benefits of GSM is that you can take a SIM card (or smart card) from one phone, plug it into another GSM-capable phone, and use it right away. A speaker lets you hold the Visor to your ear and use the VisorPhone like any normal phone; by plugging the included headset into the headphone jack on the left side of the module you can access all of your Visor's applications while still using the VisorPhone. There is also a silent alarm that you can set to vibrate instead of using one of the 12 audio alarms available. The VisorPhone uses a rechargeable Lithium Ion battery pack that provides up to 3 hours of talk time or 3 days of standby time. An included A/C adapter connects to the serial port of your Visor to recharge the VisorPhone's battery. This adapter will recharge a Visor Prism as well. The VisorPhone will also recharge when in the Visor Prism's cable, and you can still receive phone calls.